Have you ever learned how to make a vegetarian chili recipe? Some people think a true bowl of chili has to have beef, beans, chilies and lots of spices. You do have some people who can do without the beans and just include beef, peppers and spices; but who ever heard of chili without meat. If you are learning how to make a vegetarian chili recipe it is a rather new concept but other ingredients can replace the meat to where it is not even missed. Chili powder and chili peppers are what give the stew the “chili” name. Ingredients like any of the variety of beans can actually replace the meat. They give a very hearty and filling attribute to chili. I often mash some of the beans to make it thicker. If you add rice with the beans to the soup you make a full protein eliminating the need for protein normally provided by meat. If you are learning how to make a vegetarian chili recipe, try adding many of your favorite ingredients such as vegetables to a pot of chili; just make sure to use the spices and peppers and you will have vegetarian chili recipe. Heat oil in a large heavy pot. Add the onion, green bell pepper and garlic and cook until vegetables are tender. Add the vegetable stock, pepper flakes, chili powder, cumin and tomatoes. Heat to a boil, reduce heat, cover and simmer for 30 minutes. Add cooked barley and stir well to blend. Season with salt and pepper to taste. Ladle into bowls and garnish. This vegetarian chili recipe combines the flavors of three different beans. Sauté onion, celery, bell pepper with oil in large skillet. Add tomatoes, tomato sauce, sugar, salt, black pepper, chili powder, cumin, ground cumin, garlic powder and cayenne pepper. Stir in all beans; simmer 30 to 45 minutes. 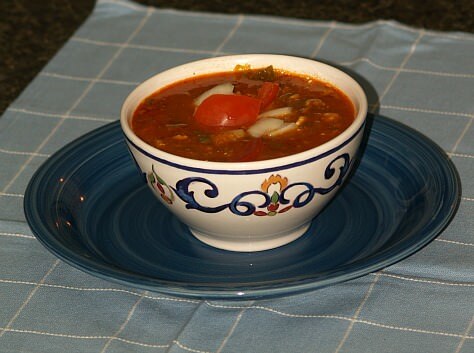 This vegetarian chili recipe uses brown lentils with a nice variety of vegetables for flavor. Sauté the onions and garlic in the oil; add cumin, chili powder and pepper flakes. Stir in the flour; slowly stir in 2 ½ cups of the vegetable stock. Whish mixture until smooth; add remaining 2 ½ cups of vegetable stock and whisk in. Add carrots, peppers, can tomatoes, fresh tomatoes, lentils, chipotle peppers, salt, pepper and cilantro. Bring mixture to a boil, reduce heat and simmer 40 to 45 minutes, stirring occasionally. This vegetarian chili recipe combines in this chili with rice recipe whole grain rice with kidney beans to make a whole protein. Sauté onions and bell peppers in hot oil in a large pot; cook 10 minutes while stirring. Add garlic, ground pepper, cumin and habanero pepper; cook and stir 5 minutes. Add rice and stir to blend; add tomatoes and vegetable stock. Bring the mixture to a boil, reduce heat to low and simmer for 25 minutes or until rice is tender. Add zucchini, corn and beans; cook and stir until zucchini is tender about 10 minutes. OPTIONS: Serve with grated cheese and spoon of sour cream.